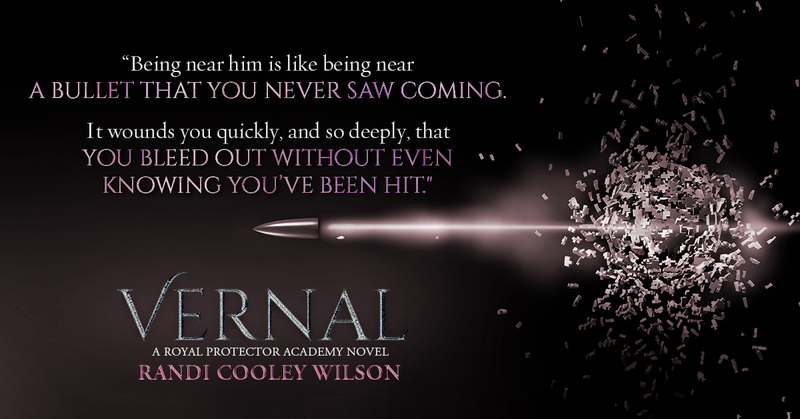 I’d like to welcome Randi Cooley Wilson to the blog today. Randi is joining us with her latest release, Vernal, A Royal Protector Academy Novel and is going to share an exclusive excerpt with us! I’m thrilled to be able to share an excerpt from Vernal, A Royal Protector Academy Paranormal Romance Novel! With a lazy grin, I stretch my arms over my head, causing my shirt to ride up a bit at the bottom. Both ladies flush at the sight, averting their gazes when I catch them. Her gaze narrows at the lie, as does the nymph’s. “As you can see, I’m not in . . . danger,” she mocks. “Why were you screaming then?” I counter. Serena looks to Freya, who offers a slight shake of her head, before turning her attention back to me. It’s obvious they’re working together to hide something. Interesting. “Yes?” The annoyance in my voice is unmistakable. “A frog?” I repeat in disbelief. “You’re afraid of amphibians?” I question. She swallows, uncomfortable with lying. “Well,” her eyes dart around the forest, searching for an answer. “They’re tailless and slimy. Unpredictable when they leap,” she adds. “Full of warts and stuff,” her voice trails off. I watch her fake a shiver for effect. It’s awkward, yet amusing, that she thinks I’m buying her pathetic reasoning. “They also have that weird sac in their throat that makes that awful croaking sound,” Freya adds in a murmur. We hold one another’s gaze in a gentle manner. The connection between us is palpable. For one perfect moment, everything around us fades out and it’s just me and her.